I saw this cute nest idea from Martha Stewart and thought it would be easy to make. I have to disclose, I am not very good at crafts. I love seeing everyone else's creativity and I get inspired but in the end ... most of the time I would prefer to just buy it already done. Cover the outside of a bowl with double-sided tape. Wind a ball of yarn (we used mohair) around the bowl until its exterior is hidden. To finish, securely tuck the loose end behind the wrapped yarn. After my third store I finally found one that sold mohair yarn and not just the run of the mill regular yard. I didn't think it would be that hard to find. I started wondering why I was out spending so much time on this. The instructions said to use double-sided sticky tape on the bowl and then wrap the yarn around. How hard can that be, right? So I pulled out my permanent double-sided tape and started to place it on my bowl and after two pieces I ran out. Eeesh. So back up to the store for more tape. I bought 2 large rolls and came home and covered the bowl with tape. Ummmm... the yarn did not stick on the tape. 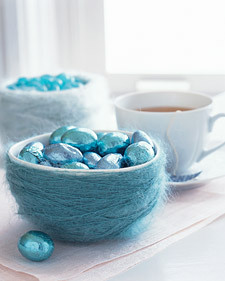 I liked the idea of the tape because after Easter I could just remove the yarn and not have to store a nest and I could have my bowl back. But since the tape didn't work and I was determined to make one of these ... I got out my tacky glue. What a sticky mess that glue is. But it worked. Now I am all ready for my egg decorating party (hope that goes a bit easier!!!). I love crafts, when I see something in the store, I say I could make that! Thanks for the idea I was looking for something hand-made to give as a hostess gift for Easter. Your bowls are adorable. Worth storing from year to year. Those "bowl nests" are so cute! It is funny sometimes how easy, quick things sometimes turn out to be just the opposite! Your finished product was definately worth it! Usually my crafts look like a second grader did it...but this is so darling--I think I could try it.